Since the 1976 publication of his first version of The American Ephemeris, 1931-1980, Neil F. Michelsen's ground-breaking series of ephemerides have consistently set standards for accuracy in astrology, becoming indispensable to astrologers worldwide at every level from student to professional. 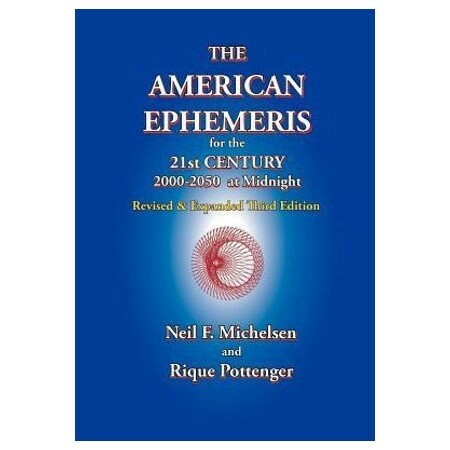 The tradition continues with this Revised & Expanded Third Edition of The American Ephemeris for the 21st Century, 2000-2050 at Midnight. Revisions and additions are programmed by Rique Pottenger, who became head programmer for ACS Publications after Michelsen's passing. Additions and improvements include new Jet Propulsion Laboratory data and programming refinements that enable finding double ingresses in a single day plus more accurate station times. A new formula increases the accuracy of the Galactic Center. Phenomena in the Astro Data section are now sorted by time as well as by date, and R appears with Planetary Ingress Data if a planet is retrograde when it ingresses. The most notably obvious additions include the dwarf planet Ceres in daily longitude listings between Mars and Jupiter, and monthly positions are given for Eris, Chiron, Pallas, Juno and Vesta.